For today’s post, I was originally going to cheat a little and turn “Tombstone Tuesday” into “Tombstone Thursday.” Upon perusing some other genealogy blogs, however, I noticed that a few authors have written about cemeteries for Those Places Thursday. So I’ve decided to go with that title/theme instead (after all, Those Places Thursday is one of the “official” Thursday themes at GeneaBloggers!). Don’t worry, if you prefer “Tombstone Thursday”, this post could just as easily be called that. Today’s entry (for the first time in this blog!) 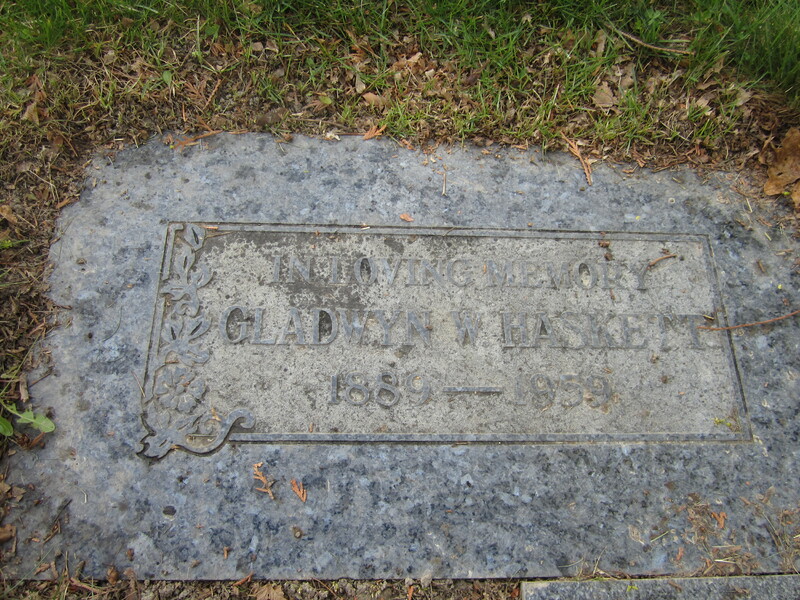 also focuses on my husband’s family — specifically, on his paternal great grand uncle, Gladwyn Washington Haskett. I don’t have a photo of Gladwyn available to share, although I hope to be able to post one eventually (I think my in-laws might have some). Here’s what I do know about him: he was born December 14, 1889 in Markdale, Ontario; he died November 1, 1959 in Penticton, British Columbia. And he was the identical twin brother of Merwyn Young Haskett, my husband’s great grandfather (whom my husband also happens to be named after). That’s about the gist of what we know about Gladwyn. 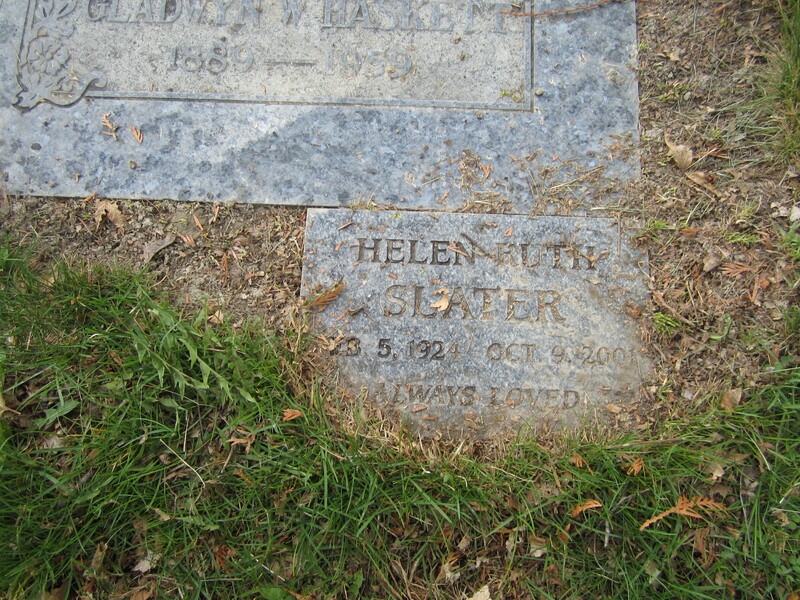 A few months ago, however — after we’d already planned a trip to British Columbia that would take us through the Okanagan region — my husband (who was doing some genealogy research of his own) coincidentally stumbled across the location of Gladwyn’s grave online somewhere (not Find A Grave, but a similar site). The cemetery just happens to be very close to the area we planned to visit. Merwyn wanted to stop by there on our way home; and, of course, I was more than happy to agree to this request! So, on April 14th (my 34th birthday) we made our way from Summerland, BC to nearby Penticton, BC. 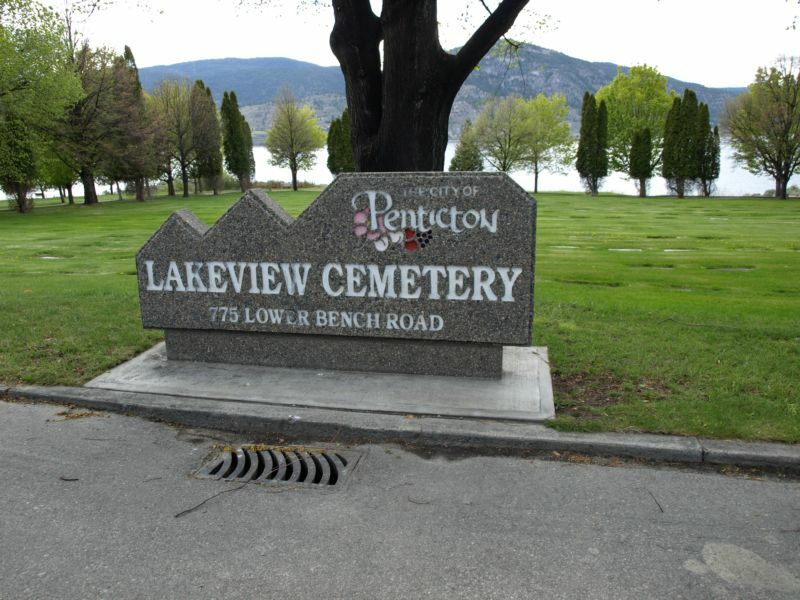 Lakeview Cemetery was right in Penticton and turned out to be quite appropriately named. 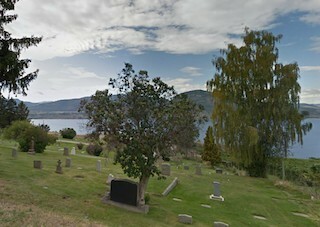 It’s a peaceful, well-kempt resting place with a beautiful view of Okanagan Lake. Merwyn had the forethought to request a map before we left, which he’d printed and brought along. So we had no trouble finding Gladwyn’s grave. It looked a little bit in need of some TLC, but ultimately wasn’t in too bad shape for being over 50 years old. 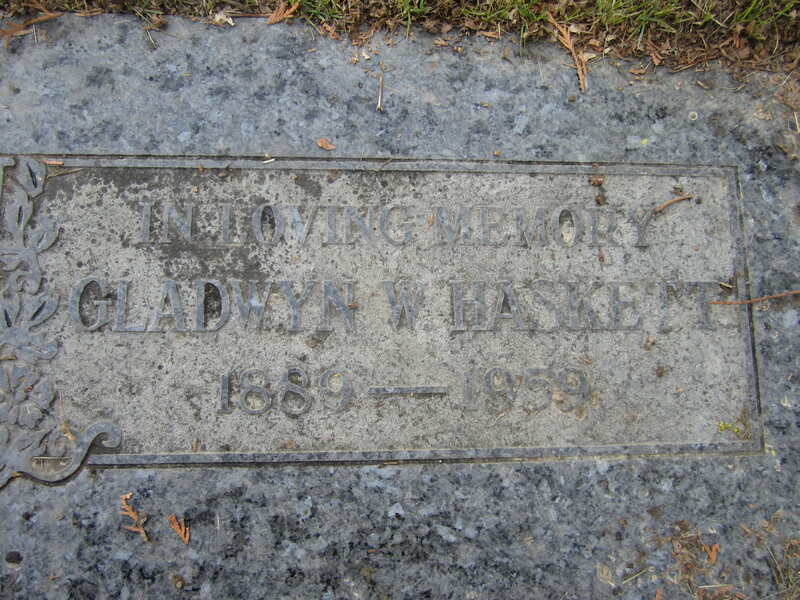 Now, neither of us knows the names of Gladwyn’s descendants (or if he even has descendants); we’re also not sure how or when he ended up in British Columbia (several from his Haskett branch still live in Ontario; and many others wound up here in Olympia or elsewhere in the United States). I was kind of hoping to find clues about some of these things at the cemetery (for example, other “Haskett” gravestones). Unfortunately, we didn’t find any such clues. Anyhow, since we still had a 7-hour drive home ahead of us, we didn’t stay at the cemetery for very long that day. But I was glad that Merwyn got to pay his respects to his great grand uncle, and honored to be along for the visit. While I’m certainly at peace with the fact that Merwyn and I can’t have kids, occasionally I’ll feel regretful that nobody will ever be able to share and combine our unique family histories. It still doesn’t keep me from wanting to know as much about my husband’s genealogy as I do about mine!